Whatsapp Emoticons quiz "Guess these Food Shop Names"
Guess these Food Shop Names from the given whatsapp Emoticons / Smileys / Stickers / symbols and give your answers in the comments. Copy Between the lines and paste in Whatsapp to forward the quiz to your friends. 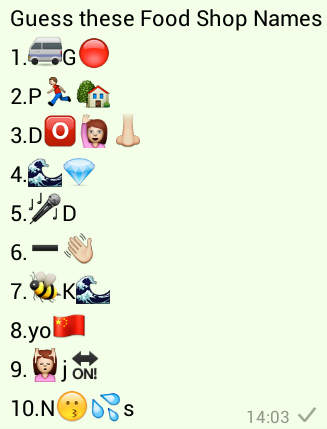 Answers to Guess these Food Shop Names Whatsapp Puzzle quiz.